The idea of collective impact is quite central to APC and our work but what is at stake is figuring out how to make it work effectively. Given that and with our members in mind, we referred to a recent study conducted by Spark Policy Institute and ORS Impact on 25 such cases, outlining what are the key lessons in making collective impact work; what kind of projects they are good for, what are the critical ingredients; what can be applicable for us. It has been about seven years since John Kanla Mark Kramer first used the term “collective impact” as an approach for solving social problems at scale. As philanthropists realise the complexity of social and environmental problems, more are looking towards holistic approaches that can address these issues at a system level. “Collective impact” was defined as the commitment of a group of important actors from different sectors that align with a common agenda to solve a specific social problem. These initiatives are distinct from other forms of collaboration in their cross-sector composition and their implementation of the given conditions necessary for population-level change. Conditions include a common agenda, shared measurement, mutually reinforcing activities, continuous communication and backbone support. 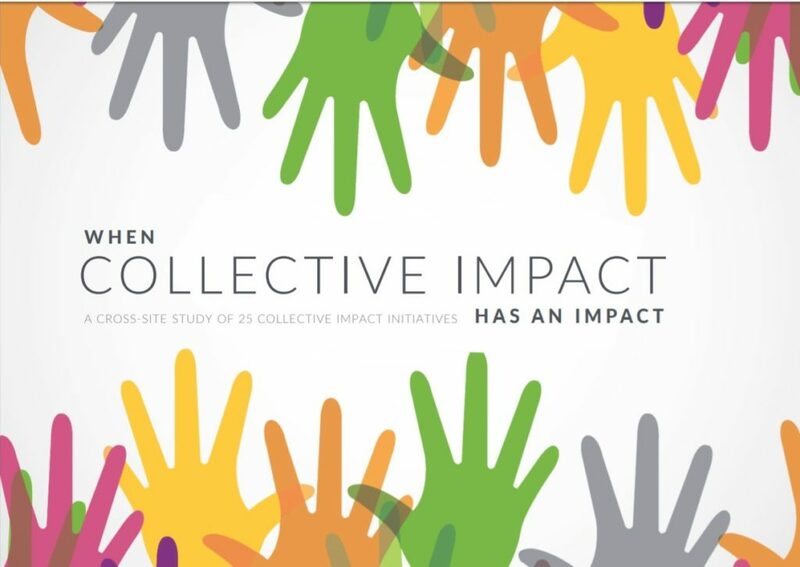 Seven years later, the Spark Policy Institute and ORS Impact conducted a study to fully understand the effects and scale of successful collective impact, as well as explain the relationship between collective impact approaches, their systems and the resulting population changes. Utilising process tracing to determine the degree in which collective impact contributed to making population-level change and solve problems that initiatives had set out to address, the study assessed the inferential strength of the hypothesised relationships across 25 study sites. Despite the fact that study sites did not have an explicit focus and/or attend deeply to issues of representation and inclusion, they are achieving impact that could be described as equity-focused, in that better systems and outcomes should benefit high-risk populations. Hence, strong implementation of equity intent and actions are assumed to lead to achievement of equitable systems and population changes. To ensure the success of future APC projects, details from these key implications for success can be extracted and translated into existing projects so that not only social problems are tackled at scale, but also, ensure that equity and change is achieved. The first implication is that collective impact is a long-term proposition and that it takes time to lay a strong foundation. Recognising that the proposition is worth the wait, taking time to develop a strong common agenda and finding a credible, skilled and ready backbone to maintain an effective collaborative environment focused on systems change are specific steps that constitutes laying a strong foundation at the start of a collaboration. Secondly, systems change can take place in many different forms. In order to do so, one must understand that a wide variety of systems change plays a valuable role towards population changes. Ultimately, acknowledging that systems change is iterative and not fully predictable helps one to understand that there is no one path or simple pattern that can be easily replicated. The next step is to remember that equity goes beyond achieving a set of outcomes; it requires intent, shifting power, and meaningful inclusion along with targeted problem definition and action. For collective impact to achieve its full and lasting potential, it is integral to re-think the systems and structures that produce inequity to begin with. Hence it is necessary to bring together community stakeholders to ensure that equity sites are intentional about representation, inclusion and empowerment. The final implication that was concluded is that collective impact initiatives take on different roles in driving change and that it is important to be open to different routes to making a difference. The collective impact approach proves that in order to inspire change, one has to be adaptable and take an unconventional route that includes leveraging existing regulations and conditions to make a difference in a diverse set of circumstances. When the collective impact approach meaningfully contributes to documented population changes, systems change occurs to support collective impact common agendas and reinforces the importance of the conditions to provide a better understanding of what equity approaches and outcomes can look like. Through leveraging the concluding statements from the study, philanthropists from different sectors are able to come together with different knowledge and expertise and tackle a social problem collectively at scale. The key to success appears to lie in actions and systems changes across the initiatives that naturally focus on high-need populations experiencing inequities. Thus, their programmatic and policy solutions have a disproportionate benefit to those groups. As a result, stronger implementation of equity intent and actions can lead to some achievement of equitable systems and population changes, with stronger results among those with the strongest equity focus. TL:DR – start engaging in a high-risk, patient and deeply thoughtful collaborative project with your APC partners today!